Deceptively Simple: POURAN JINCHI, IL LEE, and RICHARD TSAO at Art Projects International, New York, 2015. 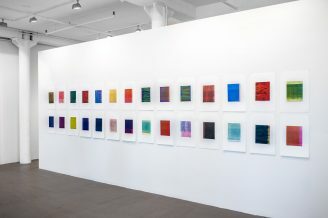 Installation view of 45 works from Richard Tsao’s Round series in Deceptively Simple: POURAN JINCHI, IL LEE, and RICHARD TSAO at Art Projects International, New York, 2015. 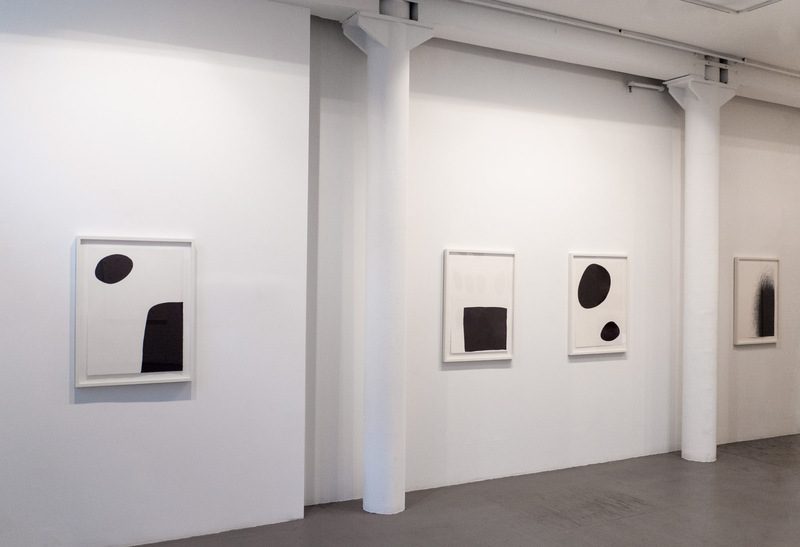 Installation view of four works by Il Lee in Deceptively Simple: POURAN JINCHI, IL LEE, and RICHARD TSAO at Art Projects International, New York, 2015. 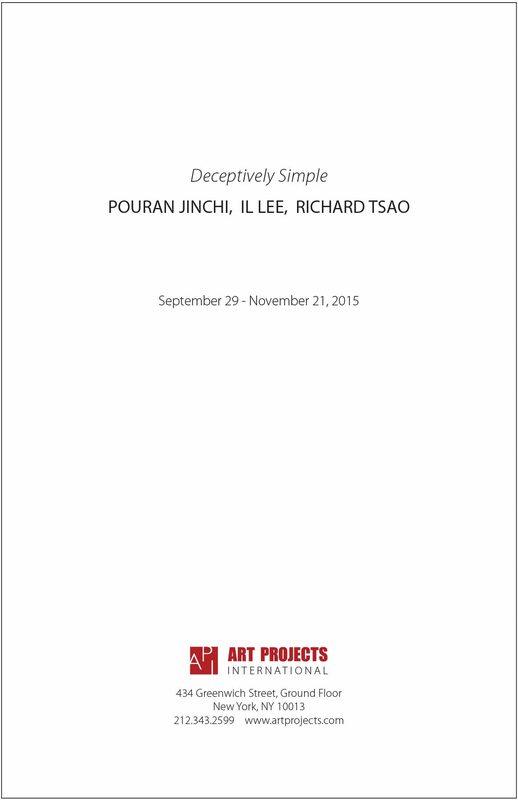 Art Projects International is pleased to present Deceptively Simple featuring rarely-seen reductive works by Pouran Jinchi, Il Lee and Richard Tsao. 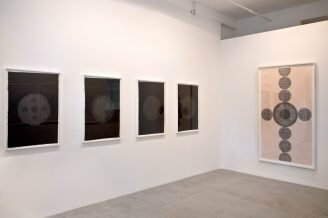 These works, most of them exhibited for the first time, include monochromatic paintings by Pouran Jinchi; hard-edge works by Il Lee; and “Round” series works by Richard Tsao. 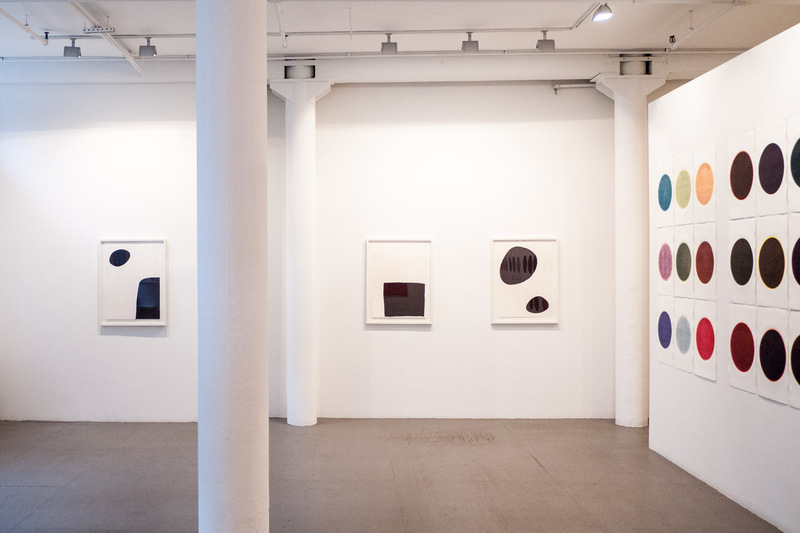 In limited series, the artists have explored specific interests, and the viewer—by viewing a repeated symbol in a color field; a single, silhouetted shape; or two vibrating colors paired—has a chance to see the artists’ thinking. 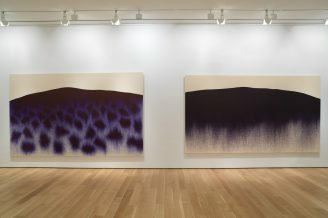 At first glance these works may seem to exist outside the artists’ usual production, but these investigations of symbol, form, and color are focused experiments that reveal how elemental concerns are manifested in the artists’ broader explorations of abstraction and artistic identity. Pouran Jinchi is known for work that uses letters of the Farsi alphabet as drawing elements. The renderings and paintings are often multi-hued and lyrical. Monochromatic paintings like Virgool and Saaken, both of 2004, are devoid of her calligraphic brushwork but further the same line of investigation—of communicating beyond language by recontextualizing symbols. Virgool presents repeated renderings of just one linguistic symbol, Saaken of another. The “saaken” is a symbol that indicates silence, and silences in language, like reduced palettes and simplified forms in painting, add meaning. Well known for his ballpoint pen works on canvas and on paper, Il Lee usually leaves visible multitudes of ballpoint pen lines as he defines space and form. In certain works from 1996, like Untitled 2696, the medium is hidden, but not completely. From a distance the clean-edged, simplified shapes could have been cut from heavy paper; Lee does not make obvious the sophisticated interplay between ballpoint ink lines and the results of their accretion. However, the viewer can, by looking closely at works like Untitled 2496 (a quirky rectangle huddled at the bottom of the paper), see how Lee has captured within the form the same complex ordering of lines as exist in his signature works. 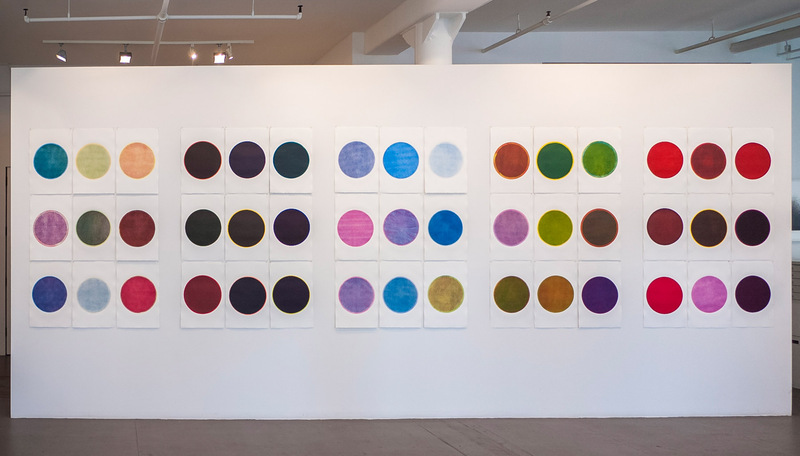 Richard Tsao’s “Round” series monotypes of the 1990s are circles, discs of color, which do not seem fixed in the physical world. Round 71 appears to contain ghosts of rumpled blue violet cloth. In Round 46, a solid purple circle’s edge flares into deep and light orange. Round 3, by comparison, is an unvariegated, dark red form, but upon inspection, it begins to jitter like the sun viewed with the naked eye. These superb monotypes take full advantage of the possibilities of transferring an oil painting onto paper. 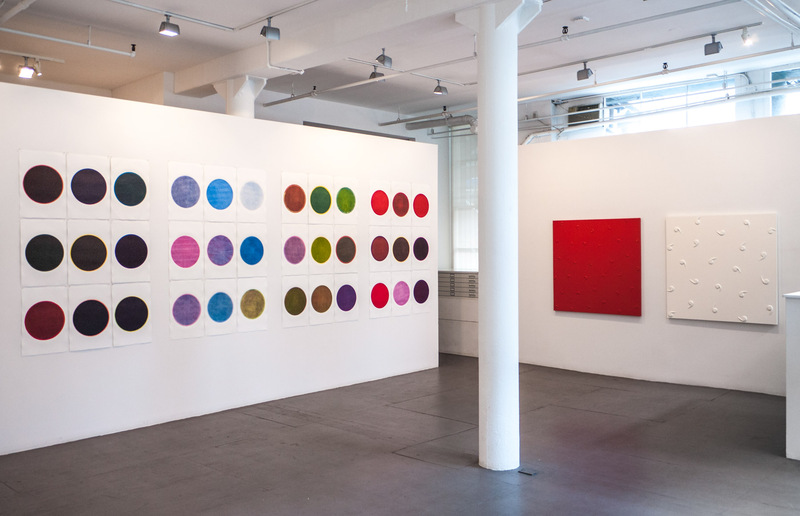 In Tsao’s paintings on canvas (many-layered works created in Tsao’s specially designed paint flood-room), the physicality of brilliantly colored paint also becomes architecture; in contrast, these “Round” works are the distillation of the spirit of color. The exhibition is accompanied by an illustrated brochure with an essay by Erik Bakke. Pouran Jinchi (b.1959, Mashad, Iran) lives and works in New York. Select museum exhibitions: New Blue and White, Museum of Fine Arts Boston, 2013; Phantoms of Asia, Asian Art Museum, San Francisco, 2012; Light of the Sufis, Museum of Fine Arts, Houston, 2010, and Brooklyn Museum, New York, 2009; Tarjama/Translation, Herbert F. Johnson Museum of Art, Cornell University, Ithaca, NY, 2010, and Queens Museum of Art, New York, 2009; Iran Inside Out, Chelsea Museum, New York, 2009; Pouran Jinchi, Vilcek Foundation, New York, 2008. Her work is represented in major collections including the Metropolitan Museum of Art, Museum of Fine Arts Houston, Herbert F. Johnson Museum of Art, Brooklyn Museum, Arthur M. Sackler Gallery, Smithsonian Institution, Federal Reserve Bank, and Farjam Collection. Il Lee (b.1952, Seoul, Korea) lives and works in New York. Select museum exhibitions: MMCA Collection Highlights: Untitled, National Museum of Modern and Contemporary Art, Korea, 2015; Extreme Drawing–Ballpoint Pen Drawing Since 1950, Aldrich Contemporary Art Museum, Ridgefield, CT, 2013; 11th National Drawing Invitational: New York, Singular Drawings, Arkansas Arts Center, 2012; Representation/Abstraction in Korean Art, Metropolitan Museum of Art, New York, 2010-11; New Vision–Ballpoint Pen Drawings by IL LEE, Crow Collection of Asian Art, Dallas, 2010; Il Lee, Vilcek Foundation, New York, 2008; IL LEE: Ballpoint Drawings, Queens Museum of Art, New York, 2007; IL LEE: Ballpoint Abstractions, San Jose Museum of Art, CA, 2007; Open House: Working in Brooklyn, Brooklyn Museum, New York, 2004. His work is represented in major collections including the Metropolitan Museum of Art, Leeum Samsung Museum of Art, San Jose Museum of Art, Vilcek Foundation, National Museum of Modern and Contemporary Art Korea, Hong-Ik University, and Duksung Women’s University. Il Lee is featured in the Metropolitan Museum of Art’s The Artist Project. Richard Tsao (b.1954, Bangkok, Thailand) lives and works in New York. Recent solo exhibitions: Richard Tsao: Works from Industry City, Art Projects International, New York, 2014; Richard Tsao: Nam Wan, Art Projects International, New York, 2010; Richard Tsao: Flooding, Art Link, Seoul, Korea, 2008; Flood, Chambers Fine Art, New York, 2005; Portraits, 100 Tonson Gallery, Bangkok, Thailand, 2004. His work is represented in major collections including the Weatherspoon Art Museum, Arkansas Arts Center Foundation Collection and Montefiore Fine Art Collection, New York.